To the degree that serfdom is political powerlessness and near-zero access to the processes of accumulating productive capital, super-welfare guaranteed income for all is simply serfdom institutionalized into a Hell devoid of purpose, pride, meaning, community and positive social roles. Jean-Paul Sartre famously wrote that Hell is other people. While this is undoubtedly true in cocktail party and workplace settings, in socioeconomic terms, Hell is a scarcity of positive social roles--the sources of positive identity, pride, purpose, community and meaning. Since meaningful work is the source of positive social roles, Hell is a lack of meaningful work. Unfortunately for us, the Keynesian Cargo Cult economists that dominate our world have zero grasp of humanity's need for positive social roles and meaningful work. In the myopic view of the Keynesians, humans are nothing but consumer-bots, heartless beings who chew through the Earth's resources in their limitless quest for more of everything--what the Keynesian Cargo Cult worships as "demand." Tragically, this blindness to humanity's need for meaning and the elevation of spiritually empty consumerism to a Secular Religion leaves the Keynesians incapable of understanding this timeless truth: the only possible result of robbing people of their livelihood is despair. Chief Keynesian Cargo Cultist Paul Krugman seems sincerely mystified that more state welfare isn't eliminating this despair, when lack of positive social roles and dependence on the state is the source of this despair. Why Middle-Aged White Americans Are Dying of Despair is obvious: their opportunities to secure positive social roles are diminishing. This is why "super welfare" guaranteed work for all is just a new version of Socioeconomic Hell. Being paid to do nothing does not provide meaningful work or positive social roles, which are the sources of positive identity, pride, purpose, community and meaning. The irony of this particular abstraction is especially rich: the more beholden we become to central states for our incomes and wealth, the more heroic the artistic expressions of rebellion against these same centralized authorities. But even these artistic rebellions are abstractions. Rather than generate meaning in a system stripped of meaning, these self-referential expressions of faux resistance and newness for the sake of something new to consume are parodies of rebellion and revolution. Artistic expression becomes an inside joke shared by self-referential elites--the very acme of inauthenticity. Self-expression and consumerism are simply two aspects of the same empty abstraction. Once the emptiness of these abstractions is realized, all that’s left is the individual’s quest for solace in a world that strips away the very qualities needed for fulfillment, purpose, and meaning. Humans draw meaning from producing, not consuming, and from belonging to a group that provides a larger goal than self-indulgence, which is the ultimate objective of spiritually impoverished consumerism. These are precisely what super-welfare guaranteed income for all doesn't provide. To the degree that serfdom is political powerlessness and near-zero access to the processes of accumulating productive capital, super-welfare guaranteed income for all is simply serfdom institutionalized into a Hell devoid of purpose, pride, meaning, community and positive social roles. This entry is drawn from my new book A Radically Beneficial World: Automation, Technology and Creating Jobs for All: The Future Belongs to Work That Is Meaningful. 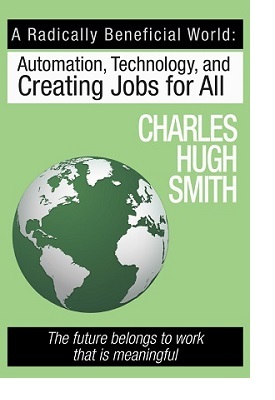 Get a 25% discount on my new book this week only: A Radically Beneficial World: Automation, Technology and Creating Jobs for All: The Future Belongs to Work That Is Meaningful. The Kindle edition is $7.45 this week, a 25% discount from its list price of $9.95. Thank you, Craig H. ($100), for your outrageously generous contribution to this site -- I am greatly honored by your steadfast support and readership. Thank you, Daniel E. ($5), for your supremely generous contribution to this site -- I am greatly honored by your steadfast support and readership.